1. Preheat the oven to 220ºC, gas mark 7. Cook the potatoes in a pan of boiling water for 10–12 minutes until tender. Drain and slice. 2. Brush an ovenproof dish with oil and place the sliced potatoes and halved tomatoes in a layer in the base of the dish. 3. 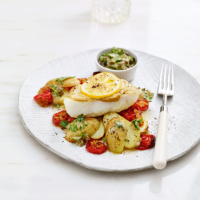 Spread the cod fillets thinly with 1 tsp of the mustard and place a slice of lemon on each. Sit the cod on top of the vegetables and brush lightly with oil. Grind over some black pepper and bake for 15–20 minutes until completely cooked through. 4. Meanwhile, place the parsley, garlic, capers and anchovies in a small food processor and pulse until coarsely chopped. Add the remaining 1 tsp mustard, the oil and lemon juice, and pulse once or twice until just blended. 5. Divide the fish and vegetables between 4 plates, spoon over a little salsa and serve with the remaining salsa on the side. This recipe was first published in Wed Apr 20 11:37:05 BST 2016.